As a proud official sponsor of the Skagit Valley Tulip Festival, we are excited to bring you this full day, small group tour of two great Northwest Washington highlights: a half day at the Tulip Festival and a hike through Deception Pass, Washington's most popular state park. Our tour includes a morning at the world famous Tulip Festival, a stop in gorgeous seaside La Conner at midday for lunch, and an afternoon hike through dramatic Deception Pass State Park. Throughout the month of April, the Skagit Valley celebrates the coming of spring with the annual Tulip Festival, a regional tradition of the last 35 years. Deception Pass is situated between Whidbey and Fidalgo Islands, boasts stunning seaside views, dense forests hugged up against cliffs plunging into the water below and mesmerizing tides that flow and churn like a river between the islands. This full day small group tour to the Skagit Valley Tulip Festival and stunning Deception Pass State Park will begin when your guide and driver picks you up at your downtown Seattle hotel in our comfortable high-roof, extended length van. As we drive north and gradually depart the city, you'll get your first glimpses of the the snow capped North Cascade mountains and Mt. Baker on clear days. After about an hour on the highway, we'll make our way along the Skagit Valley's back roads and get our first glimpses of fields of daffodils and tulips stretching before us. 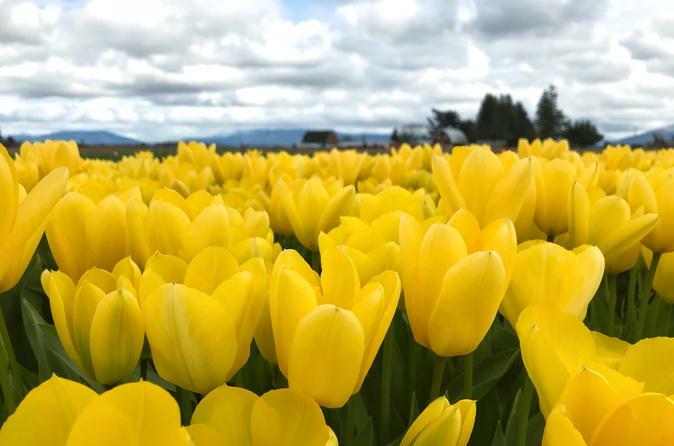 Your first stop of the day will be at either Roozengaarde or Tulip Town, the two largest tulip farms in the Skagit Valley with extensive display gardens with nearly 100 varieties of tulips and daffodils on display. Both of these gardens have row upon row of brilliantly colored tulips stretching to the horizon. We will spend approximately 2 hours at the first display garden of the day before proceeding on to the historic seaside village of La Conner. You will have about 90 minutes to explore beautiful seaside La Conner, have lunch at one of the village's many restaurants, and enjoy a cup of coffee or tea at one the many bakeries and shops that line the waterfront. Your next stop will be the Deception Pass State Park where we will stop at multiple points to admire the stunning seaside views. When the group is ready, we'll start our hike along the shoreline, the trail transitioning between the groves of Douglas Fir and Pacific Madrone and cliffs that plunge to the beach and ocean below. At openings with views to the ocean, keep your eyes out for diving ducks, cranes, and harbor seals hunting along the shoreline. As you approach the historic Deception Pass Bridge, if our timing is right, you'll watch the churning whirlpools and standing waves created by the dramatic tidal exchanges. The trail meanders and is a mix of uphill and downhill terrain. On average, we'll hike about 4 miles along rolling terrain and the beaches. The actual distance we cover will depend on the group's energy and speed. After getting beautiful pictures throughout the hike and along the shoreline, we'll head back to van for the 90-minute drive back to Seattle where your guide will drop you back at your downtown Seattle hotel.